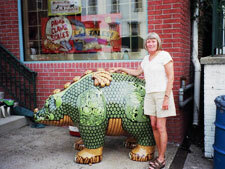 Artist Gail Fronheiser stands beside her buddy Bear-gon at Boyertown's 2006, Sidewalk Sale and Expo. 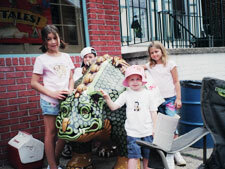 Bear-gon's Fan Club starts to form at Boyertown's 2006 Sidewalk Sale and Expo. 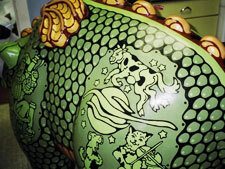 Painted details on Bear-gon include some of Mother Goose's favorite characters. It's official: The Biesecker Bear-gon, decorated by Gail Fronheiser, has established his own fan club. Membership in the club requires only a love of the bear and an occasional visit to pet him. 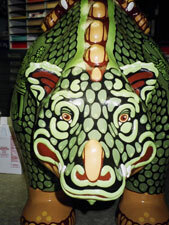 Bear-gon makes his debut at BASH's 2006 Arts Expo. Ya gotta sing! “Hey, Diddle Diddle, the Cat and the Fiddle, the Cow jumped over the moon” springs to mind at the sight of Bear-gon. 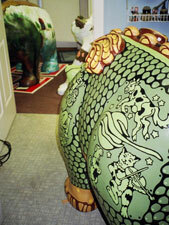 A visit to Stahl Marketing offices finds three bears in waiting: Bear-gon, Homebody, and Boo Boo. Ya gotta love the face! Dragon's can be scarey, but Bear Fever's Bear-gon looks friendly, like everyone's best friend. 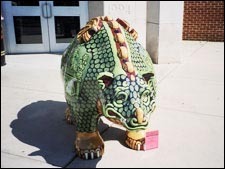 Gail Fronheiser fashioned “Bear-gon,” whom her husband Dean nicknamed “Bernie” after several discussions with sponsor Suzanne Biesecker and Boyertown Community Children’s librarian Charlotte Puff. The Bieseckers wanted the children to have their own bear. Suzanne was eager for the bear to bring smiles to the children who visit the library. An effort was made to capture the mystery and magic of the reading experience through the dragon theme and to offer children some familiar images taken from the rhymes of Mother Goose. Complementing the existing artistic styles within the library was also a consideration. Reading gives “wings” to the imagination, and so it is appropriate that Bernie have wings too. 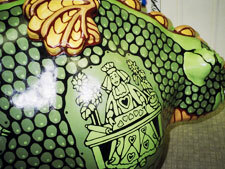 Bernie’s wings and assorted features which adorn his body were created from Magic Sculpt. Check out the detail Gail provides: his toenails, for example. Bear Fever is delighted to feature Gail’s work; originally we’d been looking for a sponsor who would ask her to feature insects in black and brown; she loves to draw bugs! Now how many people do you know whose favorite subject is bugs and who create a world of beauty using two basic, earthy colors?! She’s amazing. Fred and Suzanne Biesecker have provided their support of the Bear Fever project from its infancy--when the idea was not much more than a dream. But Suzanne’s enthusiasm and encouragement for the project at several points in its early stages was critical towards inspiring the effort. The Bieseckers are known best in the community as successful business people, but, like many successful people, they started with very little and have worked long and hard to earn their current spot in life, following in the footsteps of their hard-working self-employed fathers and grandfathers and learning from their early jobs what they did not want to do for their entire lives. Drug Plastics and Glass Company had its fairy tale beginning in a garage; they remember their first apartment for its meager floor space—all they could afford; Suzanne remembers sewing all their clothes thanks to her mother-in-law’s “hand” in securing her first sewing machine, inventing the company logo before there was a business to advertise and credits Fred’s perfectionism and love of solving puzzles—in business and in understanding history—as keys to his success. She notes that running a business means lots of responsibility; and, with fondness for the man she clearly adores, she adds that lots of people depend on him to make good business decisions and are energized and inspired by his business acumen. While Fred is a “transplant” to Boyertown, lured from Scranton, PA, by long-time college friends and associates, Suzanne has deep roots in the community and a strong desire to maintain its charm. Suzanne’s father and grandfather were both local veterinarians; her grandfather, a very sociable gentleman, served as mayor during the Opera House Fire and president of the bank during The Depression of the 1930’s. 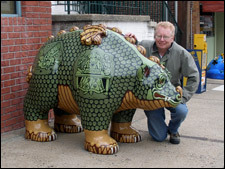 Fred also serves as a trustee for The Children’s Hospital of Philadelphia (CHOP) and keeps a close eye on details, according to Suzanne, concerning fiduciary responsibility allowing others the important work of saving lives. Their seven-year involvement with CHOP, inspired through a family medical situation, is a perfect match for their diverse styles providing inspiration in its welcoming atmosphere and in its mission of excellence. Additionally, Fred has also become very involved with the Hospital of the University of Pennsylvania (HUP). As for Suzanne, joy and meaning are found in her assorted roles as hostess, adoring wife and Mom, and resident cheerleader in her home with friends and family or on the job. Like a good teacher—the career path she’d originally followed--taking time to honor individuals like the retired workers or demonstrating changing technology are the “fun things” for her within the business. Watching others learn and stay young is part of her mission. 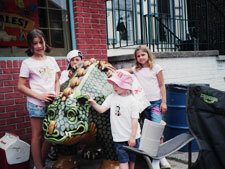 As she inspired me through her gentleness and warmth once upon a time ago, she, too, was inspired. She recalls her local mailman as an early role model who would take just a minute now and then, in the middle of his route, to sit down and listen to an older gentleman share a story about his day. Undivided attention to others often makes them “whole” and provides a “healing touch,” the mark of a “good and glorious” physician, a caring friend, or a loyal companion.